…Grooves in the sides help prevent slippage. 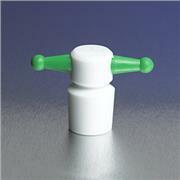 The flat top allows the stopper to stand on its head, which frees the user’s hand and minimizes potential contamination. 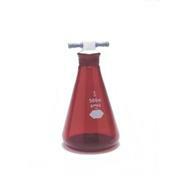 This stopper is interchangeable with other common flask stoppers and fits all standard labware of comparable standard taper size. 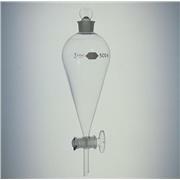 Pennyhead stoppers are generally used in flasks and separatory funnels. 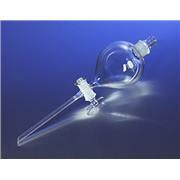 These 125mL PYREX® cylindrical separatory funnels are graduated to show approximate capacity, The PTFE plug fits into the micro-finish barrel. 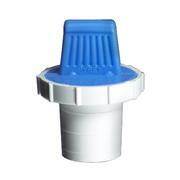 The plug also reduces freezing problems and grease contamination. 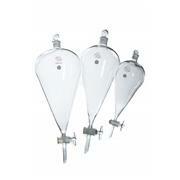 …replacement for 6340-4L) These 4L PYREX® pear-shaped separatory funnels have glass No. 8 Standard Taper stopcocks and strong, hollow No. 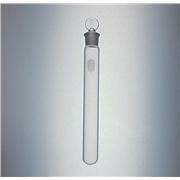 38 Standard Taper glass stoppers. 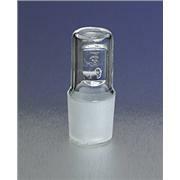 For replacement glass Standard Taper stoppers, see No. 7650; for stopcock plugs, see No. 7680; for retaining clips, see No. 7280. 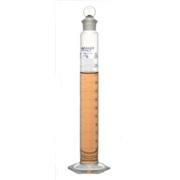 …to Class A tolerances in accordance with ASTM E-542 and E-288. Each flask is individually serialized and supplied with a Certificate of Identification and Capacity, traceable to NIST standards. For your convenience, these flasks are supplied with No. 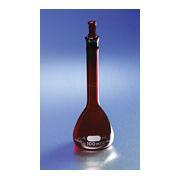 9 Standard Taper red low actinic glass stoppers. 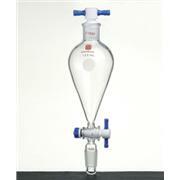 These PYREX® glass separatory funnels have Rotaflo® stopcocks and strong, hollow Standard Taper glass stoppers. 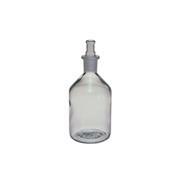 A glass stopper is also included for your convenience. Stem O.D. is 10mm. 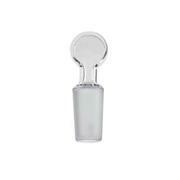 For replacement glass stoppers, see No. 7650 and for polyethylene stoppers, see No. 7624. …have closed bottoms to conform to Standard Taper stopper dimensions. The three rings on the plug provide an efficient seal. This improved design fully protects the neck in the event of accidental tipping. 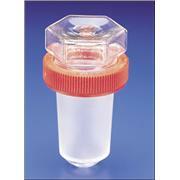 These stoppers may be used in place of the conventional glass Standard Taper flask stoppers. 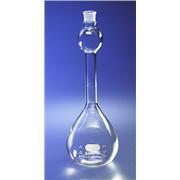 This borosilicate glass pear-shaped separatory funnel is supplied with a Standard Taper glass stopper and a Standard Taper glass stopcock. 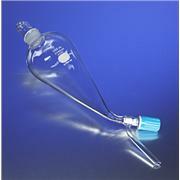 Low Form, KIMAX® Brand (Kimble 15165) Of borosilicate glass, with Standard Taper glass stopper. Bottom part of stopper is sealed. Designed from Federal Specification NNN-B-1493. Dimensions indicated in table are i.d. x height without cap. 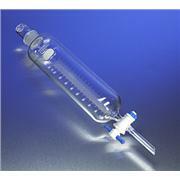 These 50mL PYREX® conical centrifuge tubes have white enamel graduations and are graduated upward from tip to 10mL in 0.5mL divisions, and from 10 to 50 in 1mL divisions. The No. 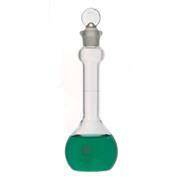 16 Standard Taper pennyhead stopper is solid glass. 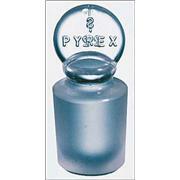 …PYREX® keyhole stoppers are made from polytetrafluoroethylene (PTFE) and conform to Standard Taper stopper dimensions. The color-coded keys make sorting and selecting the correct size much faster and easier. 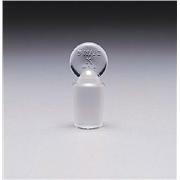 These stoppers may be used in place of conventional glass Standard Taper flask stoppers. 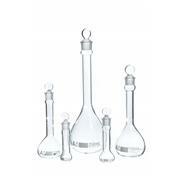 …borosilicate glass, wide mouth flasks are designed to provide pipette access along with facilitating filling and sampling. Unique flat bottom interior permits use of a standard stir bar. The heavy wall thickness gives greater durability. Supplied complete with glass Standard Taper pennyhead stopper. …have closed bottoms to conform to Standard Taper stopper dimensions. 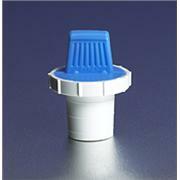 The three rings on the plug provide an efficient seal. This improved design fully protects the neck in the event of accidental tipping. 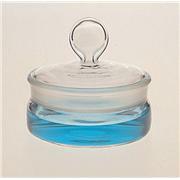 These stoppers may be used in place of the conventional glass Standard Taper flask stoppers .